September view of Highway 333. The last section of Iowa highway closed by this summer’s flooding along the Missouri River has reopened. Iowa Department of Transportation spokesperson Dena Gray-Fisher says Iowa Highway 333 into Hamburg opened over the weekend. “This project took quite a while,” Gray-Fisher said. “It was kind of a complicated situation.” In addition to removing a levee built over the roadway, railroad tracks that cross the highway had to be reconstructed. 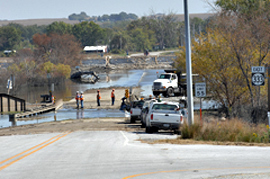 Iowa 333 was closed in June as the floodwaters approached and remained in place for several months, badly damaging the highway. Iowa D.O.T. director Paul Trombino said earlier this month that the costs to repair all of the roads and bridges damaged by the Missouri River flooding will be close to $50 million. He said all of it should be eligible for federal reimbursement as the repairs were made within the required 180 days after the flooding ended. Overall in Iowa, three major river crossings and 77 miles of interstates and highways were shut down by the flooding.